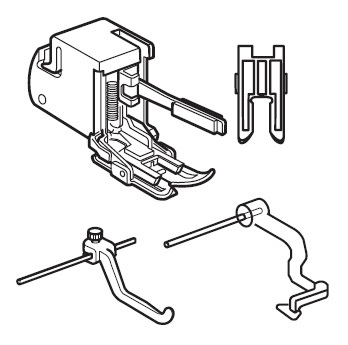 The Even Feed Foot, sometimes referred to as the walking foot, is designed with a set of feed dogs (teeth) which allow the fabric to feed without shifting or slipping and eliminates the problem of the under layer of fabric coming up short. It is an essential attachment with many benefits. Use this foot when matching stripes and checks, sewing draylons and velvets, making up knitwear or when sewing long seams on curtains especially if matching patterns. It is also useful when sewing leather, vinyls, plastics and microfiber. The Even Feed Foot is also great for topstitching. Topstitching adds that tailored look to coats or jackets but can sometimes be spoilt due to irregularity of stitching. This is often caused because of the bulk created with the seam allowance especially around collars and reveres. Using the Walking Foot for topstitching will eliminate this problem and give perfect stitching every time.